Diamond Comic Distributors is proud to reveal the artwork created by Eisner Award-winning artist Francesco Francavilla (Afterlife with Archie, Black Beetle) for the sixth annual Halloween ComicFest (HCF) 2017 on Saturday, October 28. The T-Shirt is featured in the July issue of Diamond's PREVIEWS catalog and is available for pre-order at comic shops throughout July. Known for his pulp and retro-inspired style, Francavilla's artwork is unmistakeable and dares readers to dive into a world gone by. 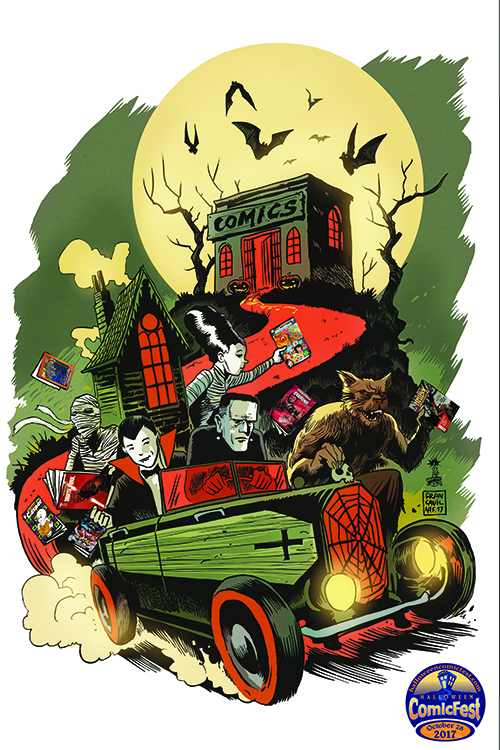 Celebrating six years of Halloween ComicFest, his art for the 2017 HCF Commemorative T-Shirt brings to life the spookiest monsters in history as they ride off to give comics to trick-or-treaters on Halloween. "After the FCBD design I did last year, I was very happy to work with Diamond on another project," said Francavilla. "When asked to work on a design for Halloween ComicFest, my thoughts went straight to the Addams Family. The family friendly horror take on that series was perfect inspiration for this project. Of course, I had to include most of the horror icons like the Monster, the Vampire, the Mummy, the Bridge, and the Werewolf." The HCF 2017 T-Shirt will be available in black in adult sizes Small to XXL (MSRP: $14.99-$17.99), youth sizes Small to Large (MSRP: $11.99), and Women's V-Neck in sizes Small to XL (MSRP: $14.99-$17.99). The commemorative HCF T-Shirt, plus the complete listing of the HCF 2017 titles, will be available in the July issue of PREVIEWS in comic shops 6/28.